Amidst the complex web that is the history of British religious nonconformity lies that curious creature known as Presbyterianism. Put simply, it is essentially a Scottish creation – or it at least took root there - before spreading south and, to a certain extent, worldwide from the 16th century onwards. In 1662, nearly two thousand ‘dissenting’ clergymen were thrown out of the Church of England, leading to the establishment of ‘proper’ dissenting places of worship – or at least gatherings or ‘congregations’ who met in private houses. One of these little assemblies had been meeting somewhat informally at Swarland Old Hall since around 1640 under the guidance of a Mr William Hesilrigge, and immediately following the ‘Great Ejectment’ of 1662 the establishment of the ‘Longframlington Presbyterian Church’ was officially announced by Hesilrigge and his followers. And it was pretty quick off the mark, too, with the construction of England’s very first Presbyterian chapel or meeting house five years later at the village’s Hole House Farm. The Longframlington Presbyterian Meeting House, established in 1667 and probably the first of its kind in England, held regular services until a new chapel was built at the North End of the village in 1739, complete with accommodation for the presiding minister. The final (and present) incarnation – on the same site and pictured below – dates from 1854. It is worth mentioning that after the 1689 Act of Toleration life for practising dissenters became a good deal easier. However, permanent bases for worship were rare before this date, so the original, purpose-built Longframlington meeting house, dating from the 1660s, really is an early call and a notable ‘first’ for Northumberland. The present chapel became a United Reformed Church in 1972 when the Presbyterian and Congregational Churches united. (1) The Battle of Brunanburh was one of the key conflicts in British history, enabling King Aethelstan of England the opportunity to establish his newly-unified nation on the world map. It took place in 937AD, pitching the ‘English’ against a combined Norse-Celtic force – the former emerging victorious. The thing is, no one has a clue as to where the battle was fought. All sorts of sites across the north of England have been mooted – one somewhat unfavoured possibility being a spot on the Great North Road a mile or two from the future Brinkburn Priory. There was (some say) an ancient place in the vicinity called Brincaburch – now long-since gone – which hints at the name of the famous old battle. (2) At some point during the monks’ residency at Brinkburn (12th – 16th centuries – some sources hint at a date of 1419), the raiding Scots threatened to sack the priory. However, because of the thick woods thereabouts, they couldn’t find it and set off once more on their merry way. The brethren expressed their thanks with a hasty bell-peal, an act which caught the ear of the distant Scots and conveniently guided them back onto their target – whereupon they gutted the place. 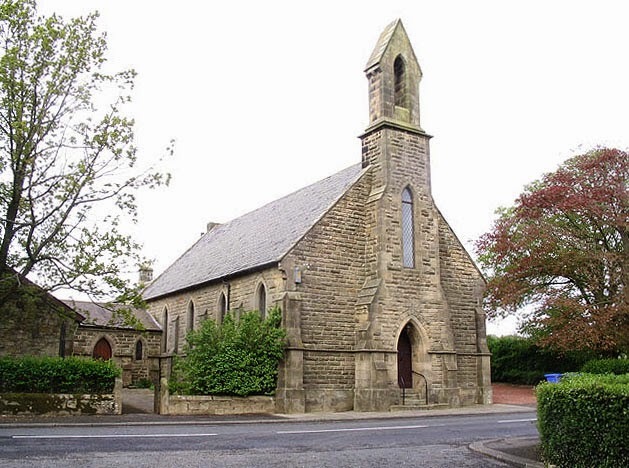 (3) After the Dissolution of the Monastaries, the bells of Brinkburn were again in the news. Tradition has it that they were recycled by being taken down to Durham by horseback … but were they? Some say they were lost en route (in the River Font, apparently); others concur, but insist they were recovered thanks to a miracle; other tales have them being buried – a fragment turning up under a tree on the riverbank opposite Brinkburn. Some say that the nearby River Coquet hides the bells, having been deposited there by the pesky Scots. And if, by some chance, they did make it to Durham, where are they? (4) In 1834 around 300 old coins were found in the grounds of the priory during the removal of a burnt-out wooden building. They were discovered under a large hollowed-out stone inside a medieval bronze pot, and amounted to what were known as Rose Nobles from the reigns of Edward III, Richard II and Henry IV. In typical Brinkburn fashion, though, the fine detail of the find seems to have largely disappeared from the history books. A few specimens made their way to the British Museum, the rest disappearing, seemingly, into private hands. © Copyright C Massey and licensed for reuse under this Creative Commons Licence. We have already seen how a nondescript terraced house in Longhorsley played a small but notable role in British history (see here) – and it is scarcely believable that the very same building should have played host to another significant event in our cultural/social history. 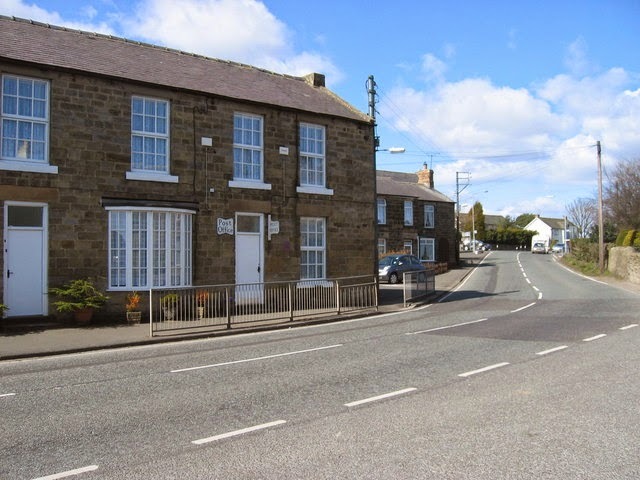 For what was until recently the Post Office building in this Northumberland village was the base from which one very enterprising local man took the first steps towards the invention of Be-Ro, the most famous of our self-raising flours. 1 South Road, which stands directly opposite the Shoulder of Mutton pub in Longhorsley, was, before it was taken over by Emily Davison’s mum, the home of the Bell family for several decades. It was a bakers and general dealers in those days and the chap who lived there with his parents, William and Ann, was one Thomas Bell. Born in 1848, his father died when he was young, leaving Ann to raise the sizeable family – and run the business – on her own. Thomas was clearly an enquiring sort, and began experimenting with flour, baking powder and various ‘raising agents’ in an attempt to improve the family’s lot. The exact sequence of events is unclear, but he is thought to have hit upon the ‘magic formula’ around 1875, and in the 1880s left the village to set up a grocery and tea business in Newcastle. Here he sold his new self-raising creation under the name of Bell’s Royal. It may not have been the very first ‘self-raising flour’ (a chap in Bristol claimed to have beaten Bell to it), but it certainly proved to be the most successful. Forced to drop the ‘Royal’ part of the name, Bell rebranded his creation as ‘Be-Ro’ (short for Bell’s Royal – his wife’s suggestion) in around 1895, and never looked back. Originally sited in the Groat Market, Newcastle, the business grew and moved – firstly to Low Friar Street, then Bath Lane. Thomas died in 1925, presumably a fairly wealthy man, but Be-Ro continued to grow in popularity, spreading across England and into Scotland – greatly assisted by the publication of the famous Be-Ro recipe books from 1923. In time, the firm was swallowed by Rank-Hovis, then, most recently, by Premier Foods. Love him or hate him, Oliver Cromwell certainly made his mark on British history. One of the most hotly disputed aspects of his time at the helm of British politics was how he interacted with those who crossed his path – and was he really quite as bad as is sometimes made out? One interesting piece of evidence in his favour comes from his brief stay at Netherwitton Hall and its environs in the summer of 1651 whilst on his way north to face the Scots. He called in for an overnight stop at the little Northumberland hamlet of Netherwitton, which was watched over by the incumbents of the aforementioned mansion, namely, the Thornton family. The army, consisting of nine regiments of foot, Cromwell’s horse guards and two regiments of dragoons (as well as assorted ‘baggage’) put quite a strain on local resources and one might have feared for the general well-being of the villagers during what must have been a fraught night. However, a rare survival from the event itself demonstrates the lengths to which the Lord Protector was prepared to go to appease those upon whom he imposed himself. On 17th July 1651, special letters of protection, signed by Cromwell, had been given to the family’s head, Lady Anne Thornton, by which ‘all Officers and soldiers under my Command, and all others whom it may concern’ were forbidden to ‘prejudice’ the said lady ‘either by offering any violence to her person, or any of her family, or by taking away any of her horses, cattle or other goods whatsoever without special order’. Despite this, of course, considerable damage was done by several thousand men and animals traipsing here, there and everywhere across and around her estate, but, soon after Cromwell had moved on, £95 5s 6d was paid to Lady Thornton as compensation for corn and grass used/destroyed by his army, as well as other random incidents such as the burning down of a barn and the consumption of sixteen sheep. What made the act of reparation especially noteworthy was that the woman in question was a known Royalist. It is, of course, likely that Cromwell’s action was little more than a ‘keep ‘em sweet’ tactic – and it is not known if any of his compensatory instinct trickled down to the lower classes of the parish, many of whom must have suffered in one way or another. However, the whole episode is a nice little insight into the sometimes murky world of Cromwellian diplomacy. 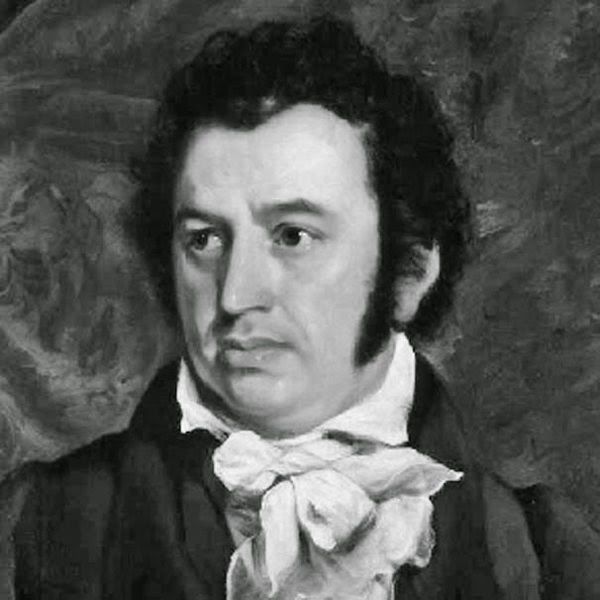 Robert Morrison, the first Protestant Missionary to China and the man responsible for translating the Bible into the Chinese language, was born at Buller’s Green, Morpeth, in 1782. He was the youngest of eight children born to a Scottish father and an English mother. Little is known of his early life in the town, his family moving to Newcastle when he was three years of age. he sweetly slept in Jesus. and died in Canton 1 August 1834. The house in which Morrison was born no longer stands, having been demolished and replaced in the Victorian era. A suitably engraved stone slab marks the spot over an archway in North Place.